Brand new Air Conditioning Units in Many of the Rooms - Same low prices!! 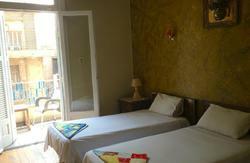 Warm, clean, and affordable, Dina's Hostel is an excellent place to stay at while in Cairo. Cathedral ceilings, high French windows, wooden floors, and sun-light filled rooms provide a quiet escape from the bustling streets of Cairo. While the hostel is newly renovated, it still maintains the atmosphere of the 1910 building in which it is located. If you are looking to stay in an authentic downtown apartment, this is the place for you. Spacious rooms coupled with modern and clean bathrooms will make your stay at Dina's Hostel comfortable and relaxing. Breakfast is complimentary and served daily from 8-11am. The common room is a comfy space to meet other travelers, have a cup of Turkish coffee or hibiscus tea, and learn about Cairo and Egypt. But, the best feature of this hostel is the helpful and friendly staff. Regardless of what your interests are, the staff at Dina's Hostel will help you have an amazing time with in Egypt. Owned and run by women, this hostel is one of its kind in Cairo. 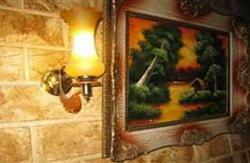 Dina's Hostel is conveniently located in central Downtown, Cairo. Not only is it walking distance to the Egyptian Museum and Khan El Khalili Market (Souq), but it is also close to many cafés and bars frequented by artists and writers and written about in the novels of Arabic writers. The hostel is also very close to many different types of public transportation. It is less than a 10 minute walk from both Nasser and Attaba Metro Stations. Ramses Train Station and Turgoman Bus Station are only 15 minutes away by foot. A taxi from the Cairo International Airport will take between 20 - 60 minutes depending on traffic. Airport pickups and dropoffs can be arranged through the hostel. * Book for 3 or more consecutive nights in a Single,Double or a Triple room you get FREE Airport Pick-up! From Talat Harb Square, take Qasr El Nil St. towards Mustafa Kamel Square. Take a left on Mohamed Farid St. It will be on the right side on the corner of Mohamed Farid St. and Abd El Khaliq Tharwat St. The hostel is very close to many different types of public transportation. It is less than a 10 minute walk from both Nasser and Attaba Metro Stations. Ramses Train Station and Turgoman Bus Station are only 15 minutes away by foot. A taxi from the Cairo International Airport will take between 20 - 60 minutes depending on traffic. Airport pickups and dropoffs can be arranged through the hostel. Book for 3 Nights or more in a Single,Double or a Triple room you get FREE Airport Pick-up!